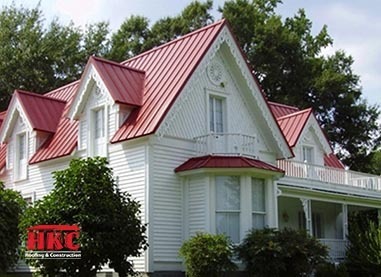 At HKC Roofing we install, repair and maintain all types of metal roof systems. Standing seam metal roofing panels have been used on traditional and contemporary homes for over a century. Cincinnati and Northern Kentucky have many metal roofs that were installed around the turn of the century and are still in use today. The Standing seam metal roof is a hot commodity because of its clean look and exceptional durability. They are relatively simple roof systems that can provide a great fire, wind, and water resistance. Architecture plays a major role in the aesthetic enhancement of a building or structure. They are installed over solid substrates at a slope greater than or equal to 3:12. Most panels have details that are designed to conceal the fasteners so that your metal roof will have a clean appearance. There is an unlimited amount of profiles, colors, and accessories when it comes to selecting a Metal Roof system. Give HKC a call so we can help guide you towards the roof system that best fits your home or building.